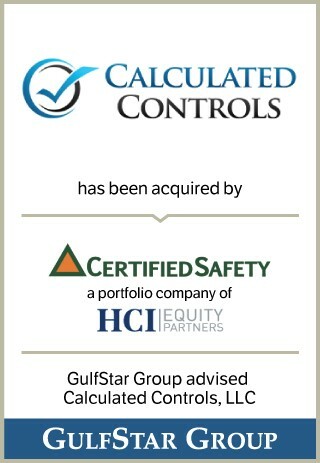 HOUSTON, January 31, 2019 -- GulfStar Group ("GulfStar") is pleased to announce the acquisition of Calculated Controls, LLC ("Calculated Controls" or the "Company") by CertifiedSafety, Inc. ("CertifiedSafety"), a portfolio company of HCI Equity Partners ("HCI Equity"). GulfStar served as the exclusive financial advisor to Calculated Controls throughout the transaction, which closed on December 21, 2018. Calculated Controls provides project control solutions and project management personnel to owners of industrial facilities, such as refineries and petrochemical plants, to assist in managing turnarounds and other major projects. The Company's trained professionals include project controls managers, field planners, schedulers, cost engineers and similar professionals. Calculated Controls offers these resources on a temporary, as-needed basis. "Calculated Controls and CertifiedSafety have had a cordial and supportive relationship since our founding," said Whitney Strickland, chairman of Calculated Controls. "This transaction is a natural culmination of that relationship. I am excited about the prospects for the combined companies." CertifiedSafety is a leading independent provider of specialized safety and productivity services primarily for plant maintenance events such as turnarounds, shutdowns, outages, and ongoing maintenance projects as well as large capital investment programs, including construction and decommissioning. CertifiedSafety also provides numerous safety-related services and personnel needed to help owners and contractors take a consistent and proactive approach to safety. "This was our third opportunity to work with Whitney," said Cliff Atherton, managing director of GulfStar. "He is a creative entrepreneur, and I am certain we will work together in the future. It was also our pleasure to work with the CertifiedSaftey and HCI Equity teams again on this important acquisition." The GulfStar team, led by Cliff Atherton, included Alex Pette, associate, and Tyler Woodby, analyst. For additional information, please email catherton@gulfstargroup.com or call 713-300-2060. Founded in 2003, HCI Equity Partners (HCI) is led by Managing Partners Dan Dickinson, Doug McCormick, and Scott Rued. The senior team of nine principals averages over 25 years of experience investing in, managing, and/or advising industrial products and services companies. Seven of nine principals have been have been CEO, President or CFO of an industrial company during their careers. HCI is headquartered in Washington, DC, with additional offices in Minneapolis, MN, and Chicago, IL. GulfStar is a leading middle market investment bank headquartered in Houston. GulfStar specializes in providing merger and acquisition advisory services, institutional private placements of equity and debt, and general corporate finance advisory services to companies with revenues or enterprise values generally ranging from $25 million to $350 million. Since its formation in 1990, GulfStar has completed more than 675 assignments in 34 states and 16 foreign countries across a variety of industries.